While I was at San Diego Comic Con Mark jumped in and did another cool guest podcast. This time it’s a film from 1968 called “The Green Slime.” Here are some words from Mark on this cult classic. This is Mark Daniels from the Great Pacific Northwest! I’m back this week with another classic science fiction movie. Today’s movie is a cult classic. 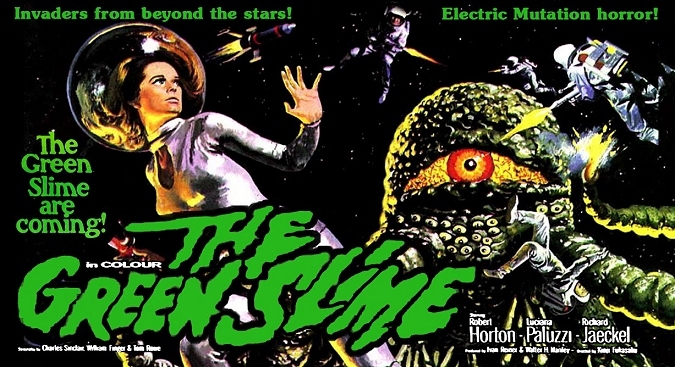 It’s “The Green Slime” starring Robert Horton, Luciana Paluzzi and Richard Jaeckel. Its got monsters, laser guns and spaceships! What more do you need? It’s a fun movie and I hope everyone enjoys it! I’ll be back soon with another classic science fiction movie! Thanks Mark for another guest show. I’ll be back next weekend with the big San Diego Comic Con Mega-Vidcast! Come back and watch that (might even be a prize to giveaway). Until then take care and enjoy your week. Please think about supporting the podcast via PATREON HERE. Thanks to all those that help support the show!